WHY ARE GASOLINE PRICES HIGH AND VARIABLE? Obama and the Pump. The Economist, Web. 17 Mar. 2012. The Economist recently had a piece which stated that the President could lose the election due to high gasoline prices. Apparently a high majority of the populace believes that the President has the power to fix it, even if he did not cause it. About all he really can do is to release oil from the Strategic Petroleum Reserve, and this ought to have an effect for a while. The last couple of times it made money for the Treasury. The President did not help himself with the non-decision on the KeystoneXL pipeline. The primary purpose of this line is to bring heavy Canadian crude down to refineries in the US. But a key segment would transport oil from the booming Bakken play primarily in North Dakota to Cushing, Oklahoma. Another portion then takes it down to the refineries in Texas and Louisiana. Absent this last bit there is a glut of light sweet oil in Cushing. Incidentally, refiners love light oil unless they have expensive equipment called cokers to process heavy crude. The reason they love it is because the starting oil has properties closer to that of gasoline and so it is cheaper to refine. Because of the difficulty in refining heavy oil always sells at a discount and there is more profit in that if you already have the right process equipment. So the folks with that capability really don’t want the light sweet oil; it costs more and idles some capacity they already paid for. In this paradoxical situation the “better” oil is less desirable. This is an overarching theme in refining: the available oil has to fit the blend suited to a given refinery. We will face this when we reduce imports. They are not all the same. Since the new domestic sources are light sweet crude, it makes sense for the first imports to target for reduction to be from Saudi Arabia or Nigeria, both sources of light oil. Of course, politics could intervene. It appears that no special permission is required to export refined product. On the other hand light sweet oil from the Eagle Ford field is currently experiencing a challenging situation. The refineries are designed for a heavier mix and so this good stuff is not moving at the world price for light oil. They would be better off exporting it and being in South Texas they are well positioned. In fact with Mexico’s Cantarell field in heavy decline, that country is looking for light oil to import even as it is exporting the heavy stuff to us. But, as I understand it, this requires Executive approval. Interesting that gasoline export does not or that it was granted earlier. Professor James Hamilton of UC San Diego has an interesting blog on energy related topics. 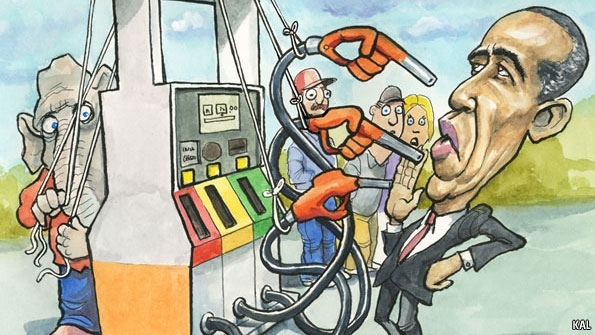 His latest one deals with this issue of extreme variability in gasoline prices at the pump. Hamilton is regarded as one of the foremost resource economists. We have referred to him before in connection with his correlations of recessions with spikes in the price of oil. He places the blame on the variability squarely on state taxes on the fuel. He shows a map of the US charting the tax in each state and it is instructive. Those of us driving up Interstate 85 from the south have noted the considerable increase in gasoline price upon crossing the state line from South Carolina. That is all about taxes, as it is for cigarettes for those inclined to inhale. California additionally has special requirements on the fuel, which further increases the cost. The price of crude local to a refinery will also be a factor. But as discussed earlier, the export market diminishes the chances of truly lower gasoline prices near cheap production. Also the local price of crude oil is low only until the pipeline infrastructure is in place. One last point: increased domestic production will not drive down gasoline prices. We cannot drill our way to lower prices at the pump. Oil is sold on the world market and except for issues of access and transportation cost, there truly is a world price. If the US increases production OPEC could reduce theirs and cause price not to be affected. Similarly gasoline has a world price. Nobody is suggesting it, but I suspect limiting gasoline export could push prices down domestically. Ultimately oil prices will come down when transport fuel substitutes are a significant force and in true competition with oil derived gasoline. Then gasoline prices will also come down to a new equillibrium with alternatives. § One Response to WHY ARE GASOLINE PRICES HIGH AND VARIABLE? You are currently reading WHY ARE GASOLINE PRICES HIGH AND VARIABLE? at Research Triangle Energy Consortium.